June marks the first month of Royal Leamington Spa’s ‘Summer of Fun’. Until September, the town centre will host a feast of yummy, action-packed community events. If you’re ready to experience summer vibes like never before, make sure to put these dates in your diary! Kicking it all off on June 16th and 17th was the Leamington Peace Festival! One of the UK’s longest running free festivals. It takes place each year on the weekend before the Summer Solstice, filling the Pump Room Gardens, in the heart of Royal Leamington Spa, with a brilliant mix of family friendly activities, free workshops, Peace talks, live music, vibrant local stalls, campaign groups, healing treatments and a wide range of vegetarian food stalls. 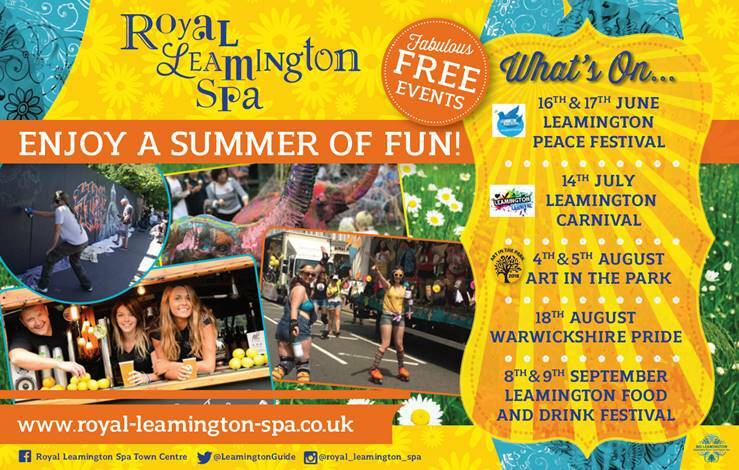 In July, Leamington Carnival will meander around the streets of Leamington on Saturday the 14th. With spectacular floats, drummers, energetic dancers, colourful costumes, live bands and much more. This is your chance to be part of this fun community event, celebrating the town’s diversity, creativity and energy whilst supporting local charitable organisations. The Carnival will wind its way to the Royal Pump Room Gardens where the celebrations will continue at the Summer Festival with 50 local stalls, food for all appetites, entertainment and Barkers Amusements Funfair will be there to welcome you! Make sure you’re ready to get creative in August when Art in the Park returns for its fifth year on 5th and 6th in Jephson Gardens. 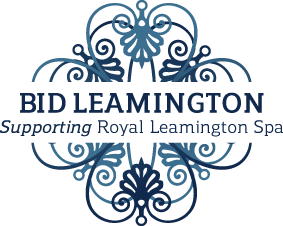 The theme this year is about ‘Trees’ to celebrate Leamington’s historic Jephson Gardens, a hidden tree paradise and host to a magnificent 4 day ‘Festival of Oaks’ in Victorian times. Enjoy a jam-packed weekend of art, creativity and fun as over 120 local makers, musicians and performers show and display a mix of crafts and arts and to fuel the fun a little more, local eateries will provide a variety of high quality food and drinks for all appetites. Warwickshire Pride, Saturday 18th August, has continued to go from strength to strength; getting bigger and better each year, while retaining its identity as a grassroots, community Pride event. Warwickshire Pride is now an established festival in Warwickshire’s event calendar, welcoming masses of people each year for a celebration of LGBT+ culture. Now in its eleventh year the annual Royal Leamington Spa Food and Drink Festival will take place over the weekend of September 8th and 9th at the Royal Pump Room Gardens. Visitors will find an exciting variety on offer, with exhibitors displaying culinary skills and cuisines ranging from delicious Caribbean food to gourmet toasties, to Indian street food and Persian delights accompanied with an array of local brews and exotic aperitifs. The Home Cook of the Year, organised by Aubrey Allen, also returns to crown Leamington’s finest amateur chef who will be judged on a three course cooking challenge and children will also be able to get their hands dirty by cooking scrumptious dishes at the kid’s cookery school all washed down with local live entertainment to enjoy all weekend. To find out more visit peacefestival.org.uk/; www.royal-leamington-spa.co.uk; www.leamingtoncarnival.org.uk; www.artinpark.co.uk; www.warwickshirepride.co.uk; & www.leamingtonfoodfestival.co.uk. Admission is free.